This month of content has been sponsored by HART Sport. And by sponsored I mean they sent me some free equipment to try out and share with you. I haven’t been paid to give a positive review or anything along those lines. Instead I took the opportunity to let my creativity run wild and come up with some great ideas for you using the equipment they sent. All equipment has been thoroughly tested by me over the past month and I’ll only be sharing what I think is quality gear. 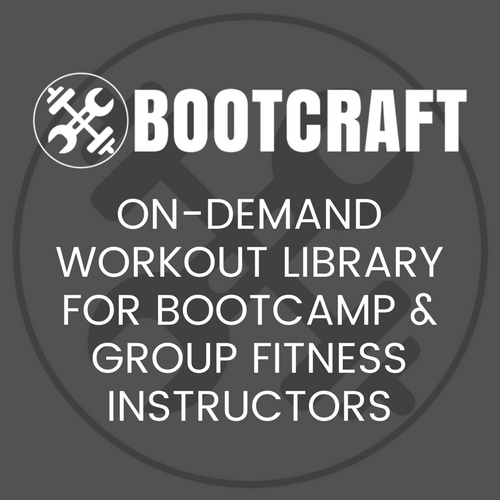 So, you’re a trainer in the market to get some equipment for your bootcamp or group fitness class. Well as you may have already found there is so much equipment out there with new pieces and variations of existing equipment being brought out all of the time. How do you know what is worth spending your money on? That’s what I hope to help you with in this post. I’ve put together three recommended kits of equipment to get, each one at a different price point depending on how much you want to spend. First up is the Budget Starter Kit which includes just the bare essentials for when you’re just getting started in group fitness. Next is the Established Bootcamp Kit which includes a more complete range of equipment. Finally you’ll find The Dream Kit which includes a deluxe selection of equipment and options. I’ve done my best to pare out a lot of the more gimmicky equipment out there. You know, the stuff that seems really good but you only end up using them once or twice. All of the gear in these kits you’ll use again and again and again. The equipment you use doesn’t make the session. An all bodyweight session can be amazing because it’s more the drill and the creativity behind the drill that makes a great session. What equipment does is gives us more options. It also helps us make exercises more challenging and adds stimulation for our clients (eg. by learning how to use a new piece of equipment). For when you are just starting out and you need bang for your buck from your equipment. All the stuff in this kit can be used in multiple ways giving you a lot of versatility. You could stick with just this stuff for a long time. Hands down the most frequently used piece of equipment in my kit. I used them to mark out drills, as a way to score points and to mark out the number of rounds for a drill. 4 years in and I was still using the same set (minus a few cones that got lost along the way) so they are a great investment. Another piece of equipment used nearly every session was my whiteboard. Write up drills, exercise legends (eg. hearts = squats), exercise lists, diagrams and more in a way that all of your clients can read them. Another really versatile piece of equipment. Light weight, easy to carry and relatively cheap, you can do a lot of exercises with these or add resistance to bootcamp exercises you already do. Start with: HART VersaBand 2x Medium ($18.90 ea.) and 2x Heavy ($19.90 ea.). HART Resistance Tubes 2x Heavy ($16.50 ea.). Bootcamps aren’t about just plugging away at sets and reps, they’re about getting a great workout while having a big of fun. Dice drills are a great way to add a random factor to your workouts. There is something about rolling dice to determine the next station, exercise or reps that really gets clients engaged and working hard. So a big set of foam dice is a must. Just like having some dice to incorporate into your workouts is great, a deck of cards can do the same thing. I’ve used cards to add a random factor to the workout and also as a way to score points for team drills. Card drills are a great way to warm up your clients or finish them off at the end of a workout. Another cheap, versatile tool. Rather than print off exercises and throw them out after each workout, get yourself a laminator and make some reusable station cards. Simply laminate 12 or so blank pieces of paper. You can then write on them with whiteboard markers and simply rub the writing off for the next workout. For when you’ve got a bit more start up capital or having been running for 12 months and are looking to up the effectiveness and variety of your workouts with some more equipment. This kit gives you one key element which is resistance. The addition of kettlebells, balls, bands and ropes will get your campers working harder and building more strength. We’ll keep our whiteboard, station cards, dice, playing cards and cones. We’re going to add to the bands (see below). Now that you’re bootcamp is more established, I recommend picking up a few more bands for your bigger class sizes. Also grab some small bands so you can start making prehab exercises more challenging. Kettlebell exercises add a whole other world to your workouts. Just make sure you’re taking the time to teach your clients how to use them properly (which means you need to know how to use them properly ie. get yourself professionally taught). Kettlebells also double as a great generic weight for exercises like Reverse Bear Crawl Drags and Farmers Walks. Recommended: Competition Style Kettlebells 3x 8kg ($59 ea. ), 3x 12kg ($79 ea.) and 2x 16kg ($99 ea.). For some reason I call these Dead Balls but now they’re known as Slam Balls. They’re the same thing. A soft (yet very solid) medicine ball-like object filled with what I believe is sand and iron filings. They’re great because they don’t bounce which means you can throw them, slam them or just use them as a weight. Great for when you’re outdoors on an uneven surface. The last item I recommend for this kit is a couple of Battling Ropes. Battling Ropes are another hugely versatile piece of equipment. You can use them for dozens of rope slamming and undulating movements, as a weight for team drills, as resistance for running drills or even as a marker on the ground travelling exercises and drills. For those that have been training for a long time and have most likely accumulated a lot of the equipment in the list along the way. It’s also a collection of my absolute favourite equipment for bootcamps. I used a lot of this stuff with clients back when we used to do obstacle course races together. We’re going to grab everything from the Established Bootcamp Kit and add to it starting with some more kettlebells, slam balls and battling ropes. Let’s also get 3 extra decks of playing cards for more variety. Let’s round out our slam ball collection with enough for a class of 20 clients. Let’s round out our kettlebell collection with enough for a class of 20 clients. Recommended: Competition Style Kettlebells 8x 8kg ($59 ea. ), 8x 12kg ($79 ea. ), 5x 16kg ($99 ea. ), 4x 20kg ($119 ea.) and 4x 24kg ($139 ea.). Let’s up our ropes from two to five. Nothing works the body quite like pushing and pulling sleds, that’s why they are a must in our dream kit! Make bodyweight training more interesting with these handy tools. Parellettes are great for different pressing variations and static holds. Porta-Bars let you get underneath and do inverted movements or high enough off the ground for exercises like dips. If you’ve got some really stand out, fit clients in your group, they’ll simply love you when you hand them a 5kg weight vest and have them do the whole workout with it on. In all seriousness, these are a great tool for balancing clients and making bodywieght workouts more challenging. Wow, I can’t believe I came up under budget again. If you want to spend the full $10k, read on below for some more recommendations. Marker cones and tennis balls. Perfect for any great bootcamp kit. I created the kits above with an outdoor bootcamp in mind which meant I left out some equipment I use and like but that are more suitable for indoors. So if you’re indoors feel free to swap out some of the equipment in the other kits for these gems below. Want to slow your clients down and get them really tuned into their bodies movement? Sliding Disks are amazing for making bodyweight exercises a lot harder. These ones can be used on wooden floors or flipped to work on carpet. Another great tool for enhancing bodyweight training are suspension trainers (think TRX) and olympic rings. Both of these add new strength, core and plyometric options to your class. Plus they help build your clients grip strength which tends to be lacking in bootcamp clients. Recommended: 6 sets of Olympic Rings ($95 ea.) or Suspension Trainers ($65 ea.). These awesome, giant medicine balls tend to be made of fabric which makes them nice to handle but if they get wet (from damp grass when training outdoors) they tend to fall apart. So it’s best to save them for indoor training. These are great for everything from strength training to HIT work to partner work. Get jumping with plyo boxes. Have you ever had a client who is terrified of jumping, but then they work their way up to that first box jump and are so proud of themselves? How good is that? Jumping is something the general population just doesn’t do, but it’s so good for proprioception and self confidence. Lastly, before I wrap up this mammoth article, there were a few other handy pieces of equipment that didn’t fit in anywhere but that I have found useful over the years. No one wants to be laying on their back on wet grass. Some hardy foam mats were always awesome for keeping my clients dry during winter. Multicoloured tennis balls are great for using at points or counters in team drills. Ever played Peg Tag? Trust me, it’s awesome. But you’ll need some pegs. Recommended: Bring your clothes peg basket from home. Another great style of training to add into your repertoire are boxing workouts. However, you will need some kit to get started. Boxing for exercise is still a great way to do HIT training that 90% of your clients will love. *Prices are current at the time of publishing this guide. One thing I recommend when it comes to building your bootcamp kit is not to feel like you need to buy everything at once. In fact, buying your equipment slowly is a nice way to keep things fresh in your sessions. Rocking up to a workout with some brand new kit you’ve not used before will get your clients intrigued and excited. Second thing, focus on buying multiples of whatever you’re buying rather than buying a smattering of different pieces. For example, if you’re going to get kettlebells, go buy 6 or more so you can use them for more than circuits rather than just buying one or two and some other equipment. Another good tip is to set aside some money every week to go into a savings account to buy equipment. Spending $500 on some new battling ropes can seem like a lot, but by putting aside just $50/week gives you $2,600 per year to spend on new equipment. Which is great because medicine balls split, exercise bands snap, battling ropes get frayed and when this happens you’ll need to replace them. Having some money aside to just do that makes it so much easier. What equipment would be in your dream set up?